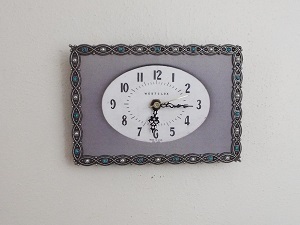 This picture frame clock is a one-of-a-kind quartz clock. The paper dial states Westclox and measures 4" by 3". Brand new quartz movement with built in wall hanger and a new battery. Silver colored metal frame compliments the reproduction paper dial. Frame has nice detail.